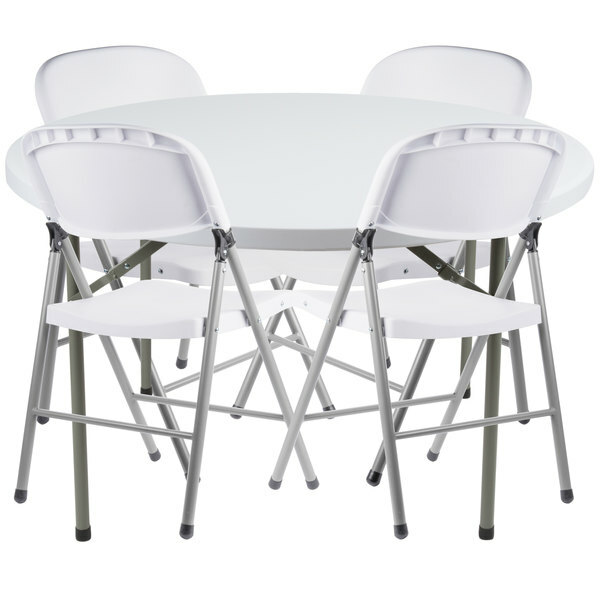 This Lancaster Table & Seating 48" round granite white heavy duty blow molded plastic folding table with 4 white folding chairs is a great addition to offices, lunch and break rooms, lecture halls, or catered events! Including a folding table and 4 matching chairs, this set provides you with everything you need to easily offer guests a place to sit, learn, converse with others, or enjoy a meal. The table top and chair backs and seats boast a high-impact, blow molded polyethylene construction that will not crack, chip, or peel, guaranteeing years of service. Not only is the material easy to clean, it also makes each piece stronger and lighter than comparable wooden folding tables and chairs, ensuring long-lasting use and quick, effortless transportation. Plus, the material allows for indoor and outdoor use for exceptional versatility in any location. The table and chairs have heavy-duty powder-coated steel frames for superior strength. Each chair features an ample 330 lb. weight capacity and is contoured to fit the shape of each individual for comfort with extended use. Meanwhile, the table is built to support the weight of your heaviest chafing dishes and platters. This complete set is versatile enough for both casual and more formal, professional settings, making it an economical choice for any business. For additional convenience, they boast rubber foot cap to protect floors from scratches and scuffs while offering improved traction on slick surfaces. After your banquet, conference, lesson, or meeting is over, the table and chairs can be folded up for compact storage. Make event set up and tear down easier than ever with this versatile Lancaster Table & Seating folding table and chair set!